286 x 208 mm. – 10 leaves, with 8 full-page woodcuts by the Strasbourg Monogrammist B, in contemporary colouring. First edition of this poem on the Burgundian wars with spectacular illustration. 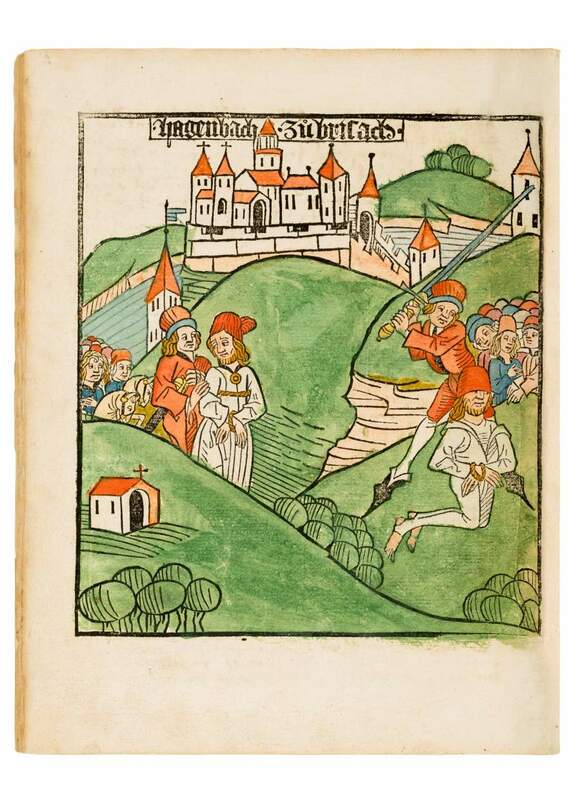 The book at hand is an exceptionally important contemporary chronicle in 423 rhymed verses, illustrated with eight fabulous woodcuts highlighting the history leading to the fall of Charles the Bold of Burgundy (1477). The work, a political pamphlet, is a very rare triumphant poem published 1477 upon the death of the duke, demonstrating how the new art of printing could immediately react to the latest events. The story opens with the trial and execution of Peter Hagenbach, the duke's local baillif, as narrated by a Strasbourg author and illustrated by a Strasbourg artist. All's well that ends well, here with a festive procession around Strasbourg's Cathedral, illustrated in print for the first time. Contemporary handwritten notes from a lecturer in Thann mention the destruction the Swiss brought to the Sundgau and Schwarzwald. This is not only a prime historical document of the Upper Rhine region, but of the Swiss confederates as well.